Columbia City Gallery is pleased to present the work of 26 regional visual artists in rock, paper, scissors, the 6th Annual Juried Exhibit. The exhibit runs September 28 – November 20, 2011. Jurors for the exhibit are Dan Corson (Artist and Seattle Arts Commissioner), Deborah Paine (Curator and Collections Manager, Seattle Office of Arts & Cultural Affairs), and Barbara Earl Thomas (Artist and Executive Director, Northwest African American Museum). The jurors selected 30 pieces from 26 artists. Rachel Kotkin is a conceptual artist living in Seattle; her work, “First Edition” (shown right) was motivated by ideas and aesthetic. She experiments with a wide range of mediums and raw materials in order to create more engaging works of art. She says, “With the advent of tablets and e-readers, the book seems headed for rapid extinction. First Edition challenges the viewer to wonder; if the Rosetta Stonene was at one time a major literary discovery to a lost civilization, could the book be our modern day artifact? 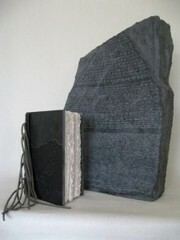 A book made of slate, acid-free paper and leather is certain to outlast an e-reader and perhaps even the cardboard reproduction of the Rosetta Stone it stands next to.” In addition to Ms. Kotkin, the artists included in the exhibit are Jacqui Beck, Betsy Best-Spadaro, Anna C Bitners, Mary Cairns, Minh Carrico, Virginia H Davison, Frank Duckstein, Dawn Endean, Batya Friedman, Betty Hageman, Aron Hart, Diane Jacobs, Marcy Johnson, Lita Kenyon, Rachel Kotkin, Emma Levitt, Annie Lewis, Elinor Maroney, Ulrich Pakker, Matthew Patton, Stan Raucher, Claudia Schlosser, Patricia Baldwin Seggebruch, Kevin Uehara, Hannah Viano, and Carmi Weingrod.